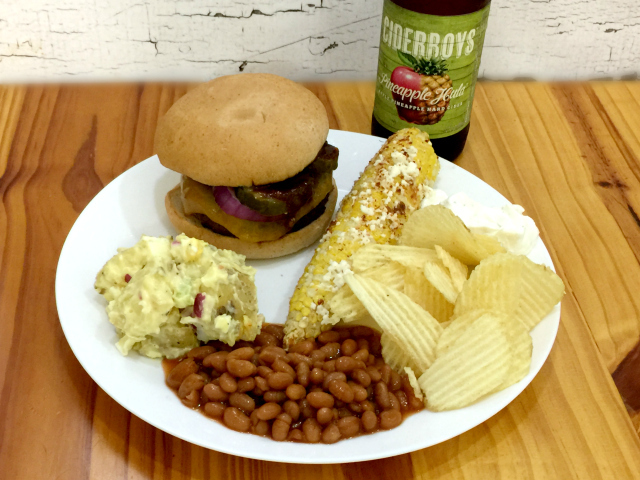 What’s a gluten-free, vegetarian backyard BBQ look like? 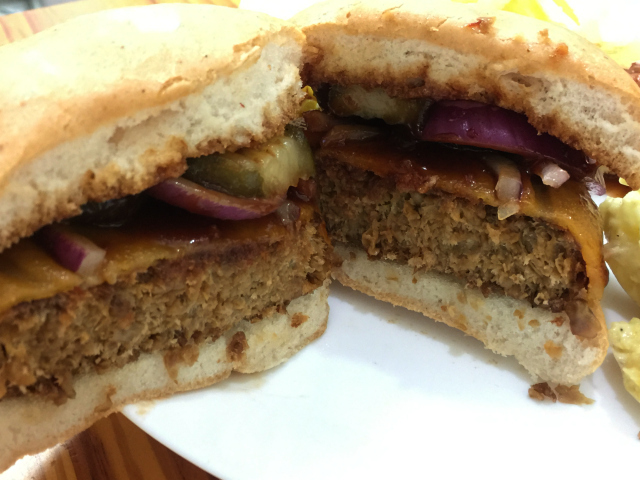 I finally got a chance to try the Beyond Meat burgers. I had them shipped from Vegan Essentials since they aren’t easy to get in my area yet. My favorite fella grilled them on our gas grill. They smell meat-y when cooking and even “bleed” a bit because of the beets. 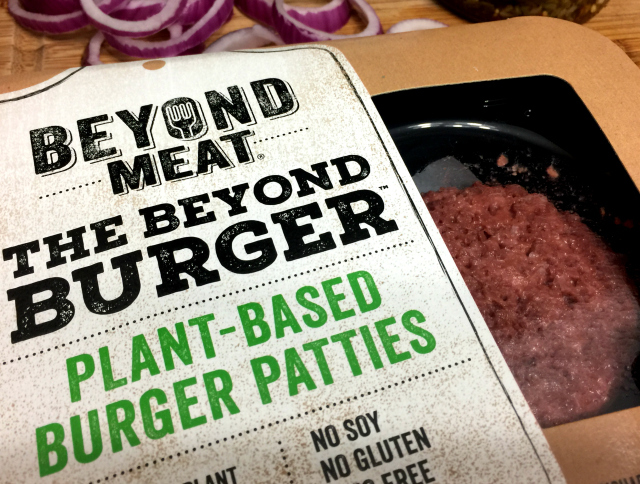 I like them, but think I’ll stick with the Beast Burgers from the same company for most of my burger needs because of cost and availability. Potato Salad! 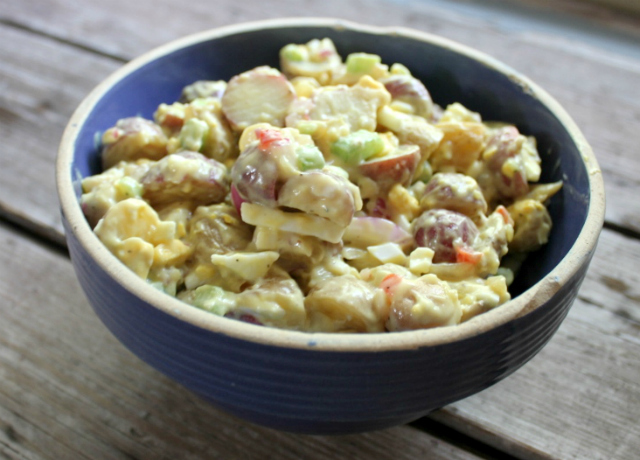 Where I’m from, a BBQ isn’t complete without potato salad. I used my simple recipe found here. Instead of cooking the potatoes and the eggs on the cooktop, I cooked them in the Instant Pot. So easy and much less heat added to the house! Baked beans. From a can, probably put there by a man, in a factory downtown. Well, actually from the Bush’s Beans factory, wherever that is. Love their vegetarian baked beans when I’m in a hurry. According to Bush’s, all of their canned bean products are gluten-free. Potato chips and French onion dip. Check both labels clearly for gluten content. I have no idea why that combination screams summer to me but the only time we ever eat that here is for a Summer BBQ. Elotes, Mexican street corn. 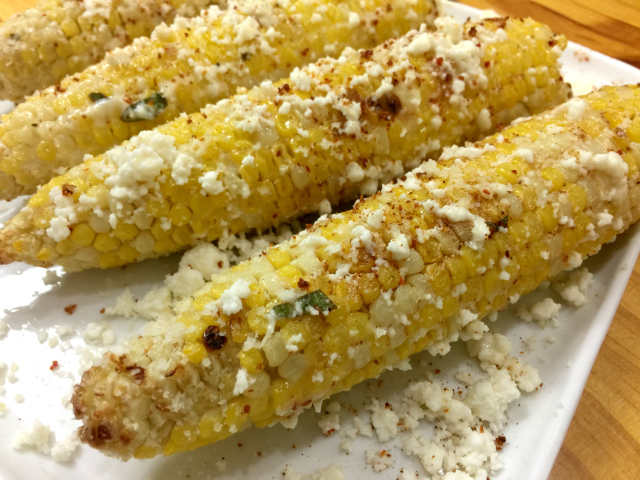 I don’t follow a recipe per say, just grill the corn, mix a little lime juice with Just Mayo, smear it on the grilled corn and then sprinkle with queso fresco and parmesan, chile powder and smoked paprika. If my cilantro plants are cooperating, I mix a little chopped cilantro in with the mayo/lime juice blend. About beverages: I’ve never been much of a beer drinker. In the Summertime, I lean toward hard ciders so cold they are almost frozen. My fella enjoys a cold Ground Breaker beer or a Holidaily when we can snag either of them here in Missouri. That requires that we either mail order or snag some on a trip to Colorado. BUT WORTH IT. Please be so cautious when shopping for gluten-free beer. My local supermarket goes round and round with me and their gluten-free labeling of beers that are NOT gluten-free, like Omission and New Belgium’s Glutiny. 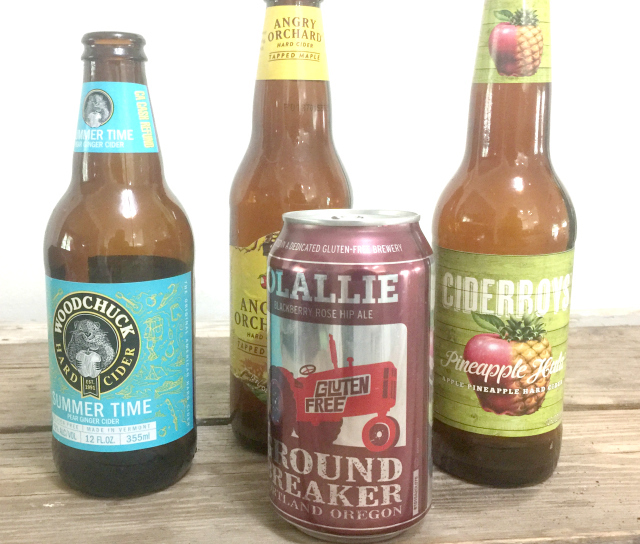 If you must avoid gluten, do not drink these “gluten-removed/reduced” beers which legally cannot be labeled gluten-free. More on that issue here. And for dessert? 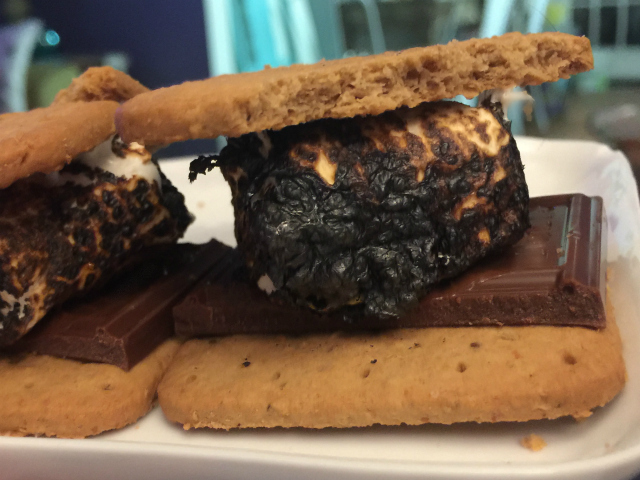 S’mores, of course! This time we had Schar’s Honey Grams with the usual Dandies marshmallows (or the Trader Joe’s variant) with Enjoy Life dark chocolate bars for me, Hershey’s for my favorite fella. Our gas BBQ grill ran out of gas before I got there with marshmallows so we used the handy kitchen torch to roast the marshmallows. My point in sharing this: while what we eat at summer BBQs and picnics might be a bit different than a standard eater, we can still enjoy most of what we ate before any dietary restrictions or changes in our choices. Take precautions with cross contamination when sharing with friends, but don’t give up. Get out there and live life, even if you have to bring your own food! Looks amazing! What buns are you having with the burger? I find that good hotdog or hamburg buns are almost impossible to find! The buns in the photo are from ALDI, some they had during their May gluten-free extravaganza. I stuck a few packages in the freezer for when the local stores didn’t have much to choose from. My favorite though are the Canyon Bakehouse gluten-free buns. But I agree–good ones are almost hard to find. I need to get it together so I can mail order in advance. If you want better store bought buns ask for a package out of their freezer. One of my local stores puts them on a shelf in the bakery section. They may feel fresh but by the time you get them home they are already old and ready to full apart. The buns should be kept in the freezer sections.